Between work, blogging, and things to do around the house, sometimes it seems like I’m short on time. But appetites don’t consider your schedule. If you’re hungry, you’re hungry and you want something GOOD to eat. Sure, on some days I might be able to swing a salad or soup – something quick, but on other days (or weekends), that just isn’t going to fly. Especially not when you have kung fu students who have been practicing their kicks, blocks, and punches all day. What do you do when you’re hosting a martial arts class and you need something easy and delicious to feed the everyone after a day of training? I’ll tell you what I did; I head right over to Walmart, where I grabbed the Hickory BBQ Beef Kraft Recipe Makers and some beef chuck roast. We’re eating sandwiches. Hearty meat-filled sandwiches. When I got home, I read the instructions on the back of the box and was happy to discover that this would be a very easy meal prep. Slow cooker – check. Beef chuck roast – check. 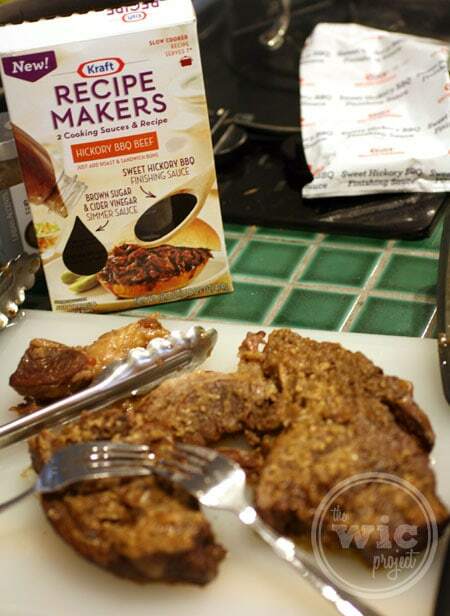 Kraft Recipe Makers – check. All the sauces you’ll need are inside the Kraft Recipe Makers box! First, I put the beef into the slow cooker and poured the included Brown Sugar & Cider Vinegar Simmer Sauce on top. After letting the beef cook for about 6 hours, it was time to shred the beef using a pair of forks to tear the meat apart. Gil couldn’t wait. He grabbed a quick bite of the beef even before we added the Sweet Hickory BBQ finishing sauce. I couldn’t blame him since the house smelled delicious – like a good home cooked meal. After the beef was shredded, it went back into the slow cooker with the finishing sauce for another 30 minutes. Once it was done, I set-up the sandwich station so everyone could make their own sandwiches. Not shown – mashed potatoes and collard greens! Fortunately for me, I remembered to grab a plate for myself before serving it. It’s a good thing I did, too. Nothing speaks more highly of a meal when the plates come back empty. 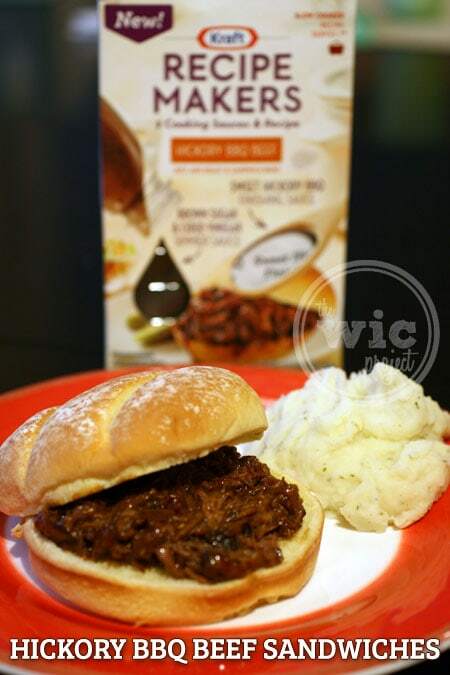 The Hickory BBQ Beef was so tender and flavorful, it could have been served at a BBQ restaurant. 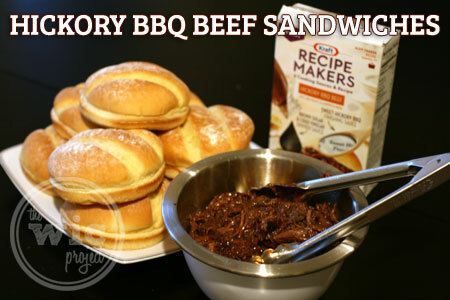 I think what I love the most about making the Hickory BBQ Beef sandwiches using Kraft Recipe Makers was simply how easy it was to make. Throw it in the slow cooker, pour on the sauce, and walk away. Actual time spent “prepping”? Probably less than 5 minutes, with most of that from shredding the beef. I didn’t have to shop for extra ingredients, measure things out, cut things into portions or any other prep work. Talk about a time-saver! I also really liked that it allows you to really create a home-cooked meal, using real ingredients. 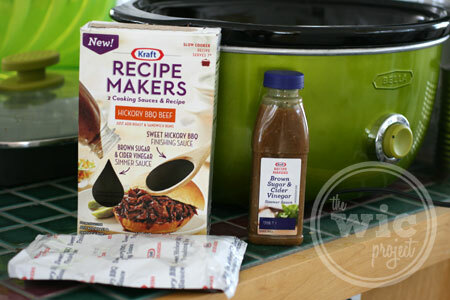 The Kraft Recipe Makers provided the sauce, you provide the meat and the side dishes. The result is truly a delicious dinner that you actually cook, but no one would guess that you used a meal helper. If you find yourself short on time, or if you just want an easy way to cook family meals, I encourage you to check out Kraft Recipe Makers. They have nine different meal options that each provide the savory sauces you’ll need to make your meals. I found Kraft Recipe Makers in the Pasta/Soups aisle near the spaghetti sauce. You can also print out this Kraft Recipe Makers coupon and save $1.50! We haven’t had BBQ beef sandwiches in so long and this sounds really good. I’ll have to try it. These look delicious — I love time savers in the kitchen, but my husband is highly allergic to anything with MSG in it, and usually prepared sauce mixes have it in them. I will have to check these out, though — maybe this time I am wrong. Haven’t heard of these before. Now I’m hungry for some BBQ.